During the month of August, the Coptic Church celebrates the Feast of the Transfiguration of our Lord Jesus Christ on Mount Tabor. The Feast of the Transfiguration is considered one of the seven Minor Feasts of the Lord. The Transfiguration is mentioned in Matthew 17:1-13, Mark 9:2-13, and Luke 9:28-36. It is stated in both St. Matthew's and St. Mark's Holy Gospels those six days after the Lord's conversation with His disciples regarding the Cross-, He took St. Peter, St. James and St. John on a high mountain and was transfigured before them. St. Luke alludes to the same story but the length after the Lord's conversation was eight days. Is there a contraindication in Holy Scripture? No, it is thought that St. Luke counted the day of His conversation about the Cross-and the day of the Transfiguration; and that St. Matthew and St. Mark did not count those two days. This explains why St. Luke used the phrase, "about eight days after," while St. Matthew and St. Mark mentioned that it "was after six days." On this day, Apip 24th (July 31st), we celebrate the martyrdom of Saint Abanoub, the child martyr. 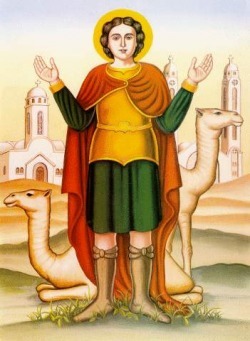 Saint Abanoub was only twelve years old when he was martyred by the Roman ruler. On July 31 our Church celebrates his death, as the day of his birth into eternal life. Saint Abanoub's relics, as well as the relics of many Christians who died with him, are still preserved in St. Virgin Mary and St. Abanoub church in Samanoud. It is also said that the Holy Family visited that place during their Flight into Egypt. 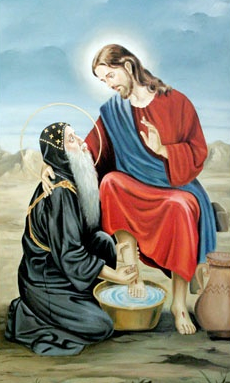 The church still contains the well from which The Lord Jesus, St. Mary, and St. Joseph drank. Numerous apparitions and miracles do occur in that church until this very day. 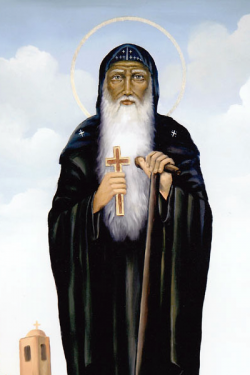 Saint Abanoub was born in a town called Nehisa in the Nile Delta. He was the only son of good Christian parents who died when he was a young child. At age twelve Abanoub entered the church to hear the priest asking the congregation to remain faithful during the persecutions provoked by Diocletian, the Roman emperor. On this day, the two great saints Peter and Paul, were martyred. Peter was from Bethsaida, and he was a fisherman. The Lord chose him on the second day of His baptism after He chose Andrew his brother. He had fervent faith and strong zeal. When the Lord asked His disciples: "Who do men say that I am?" So they answered, "Some say John the Baptist, some Elijah, and others Jeremiah or one of the prophets." ... Simon Peter answered and said, "You are the Christ, the Son of the living God." (Matthew 16:13-20). After he received the grace of the Holy Spirit, he went around in the world preaching of the crucified Christ, and he converted many to the faith. God wrought great and innumerable signs and wonders by his hands. He wrote two catholic Epistles to the believers. When he came to the city of Rome, he found there St. Paul the Apostle. Through their preaching, most of the people of Rome believed, so Nero seized Peter and commanded to crucify him. Peter asked them to crucify him head downwards, and he delivered up his soul into the hand of the Lord.